Completed in 1860, the Floral Hall, as it was then known, was used as a flower market during the day and transformed into an events venue in the evening. 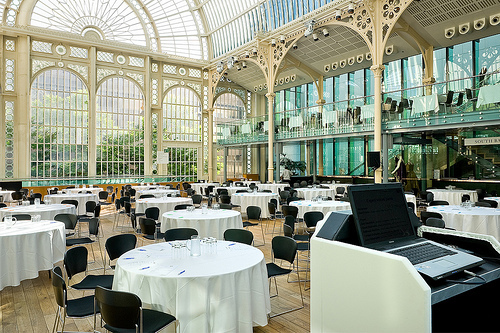 After careful restoration in 1997, the history of what is now known as the Paul Hamlyn Hall continues, with events being held in this space as fabulous and stunning as the surroundings. With its magnificent barrelled roof and stunning ironwork, the Hall is ideal for those wishing to provide drama and glamour for their guests. This light and spacious venue is perfectly suited for such daytime events as lunches, conferences or launches. Hire of the Paul Hamlyn Hall also includes the newly completed Davies Terrace with its balcony over Bow Street.